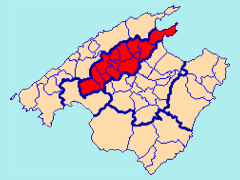 The Raiguer county (Es Raiguer) is a long corridor that extends from Palma to Alcúdia, via Santa Maria del Camí, Binissalem, Inca and Sa Pobla. 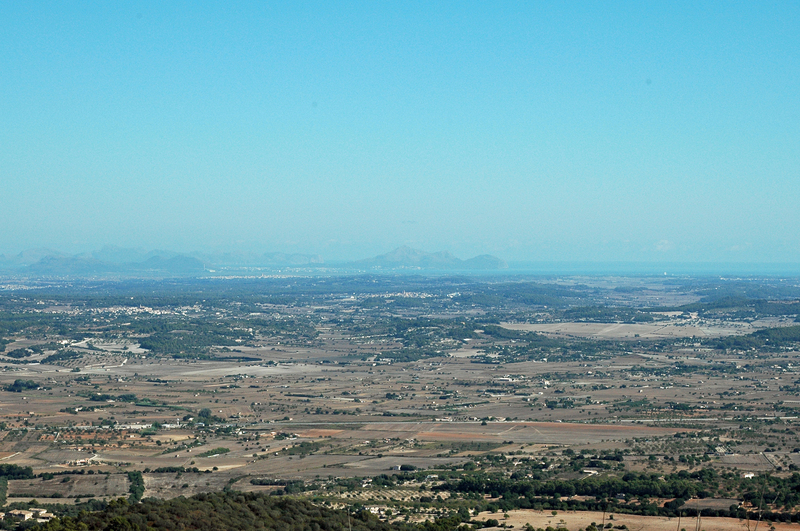 It is a flat area along the eastern foothills of the Serra de Tramuntana. 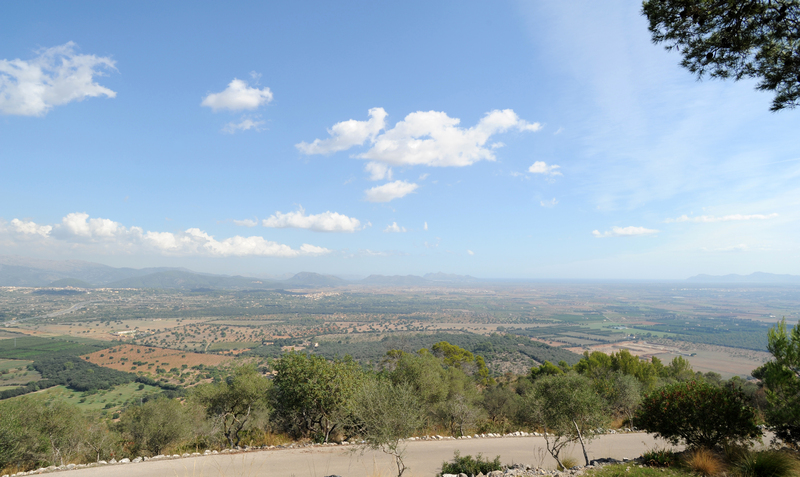 South and east lie the vast plains of Es Pla de Mallorca (Mallorca Plain), punctuated by hills topped by a monastery, a chapel or a castle. Raiguer cities have few exceptional sites except churches in cyclopean appearance, but these cities show spectacle of Mallorca in the past. We will discover hidden monasteries, manor houses, wells, former Arab mills, and villages off the beaten track with their traditional inns established in centuries-old cellars. In the plains, roads and intersections have for centuries been marked by crosses, often of singular beauty. There are pleasant walks in the peace of the countryside, with its stone walls, its mills and among lush Mediterranean vegetation. Protection against wind, offered by the Serra de Tramuntana, promotes the cultivation of almond trees that bloom in January and February, is a typical tourist image of the island of Mallorca. 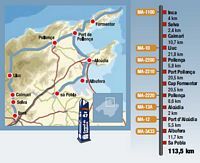 Although the highway Ma-13 is faster, it is more interesting to browse the Raiguer county follow the old road Ma-13A from the center of Palma. Inca, the capital of the county of Raiguer, is known for its leather and shoe stores, its "bodegas" or "cellers", which have been transformed into restaurants, old-style Santa María la Mayor and two convents. At Selva, situated atop a hill, visit the parish church with its steps flanked by cypresses. Cross Caimari, through olive groves and continue towards Lluc in the county of the Serra de Tramuntana, through the cliff of "Salt de la Bella Dona". Peace and silence prevail in the monastery and its surroundings, which are a must see. Follow the road down to Pollença, with its chapel of Calvary and its Roman bridge and continue to the beautiful bay of Pollença. Port de Pollença is a privileged and residential tourism. Formentor offers a unique landscape with a beautiful beach, pine forest, a popular hotel and the amazing views from the road to the lighthouse. 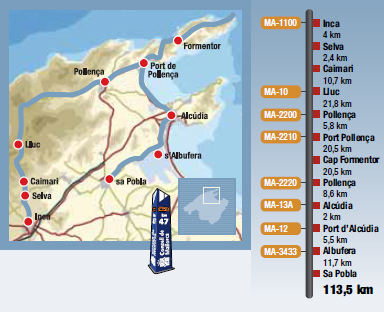 Continue along the bay to reach Alcúdia, where you can visit the medieval walls and the remains of the Roman city of Pollentia. The port, which is still occupied by fishing boats and freighters, has also become a tourist center, like other places in the region. Go around the S’Albufera Natural Park a wet wildlife and very diverse flora area, to get to Sa Pobla with fields that have been reclaimed from the marshes and museums of contemporary art and toys.